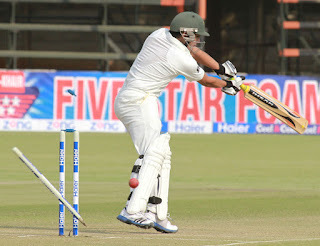 Home Blogs Bouncers Featured Pakistan Pakistan in Zimbabwe 2013 [Bouncers] Batsmen of just six runs! [Bouncers] Batsmen of just six runs! 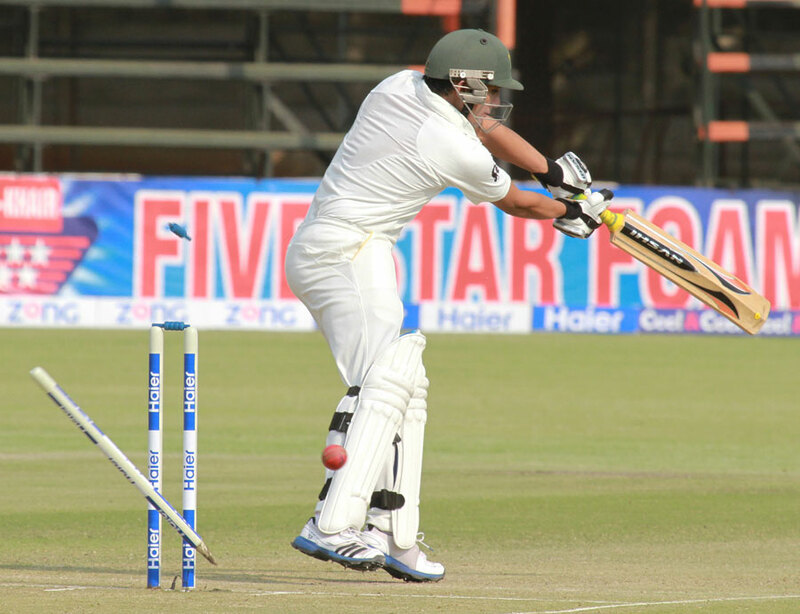 Pakistan scored 249 all out in the first innings of the first Test against Zimbabwe. Out of this, Saeed Ajmal scored 49 runs and Azhar Ali and Misbah-ul-Haq jointly scored 131. That means rest of the eight players including four specialist batsmen and one wicket-keeper scored just 69 runs in aggregate. Apart from Azhar and Misbah, the remaining four specialist batsmen scored a total of 23 runs - or 5.75 runs each. This is the tale of Pakistan’s first innings against Zimbabwe. After watching the first innings at Harare, I have no choice but to accept my mistake that I had wrongly envisaged the tour as one-sided. I had expected this to be a charmless and boring tour and thought that Pakistan could easily whitewash in all three formats. I thought that fans' interest in the series would be restricted to knowing the victory margin of Pakistan, for there would be now a question of their defeat against the minnows Zimbabwe. The expert would call it a good preparation opportunity before matches against Sri Lanka and South Africa. But Pakistan has made even this tour interesting, for they have the inbuilt ability to make any match of any format against any team exciting. Earlier this year Pakistani spectators had the same excitement during ODIs against South Africa as they had against Zimbabwe in the one-day series. Pakistan had a thrilling series against the top team where the last match was the decider and now Pakistan have made ODI series interesting again a team like Zimbabwe. During T20s Pakistani bowlers were struggling to take wickets but this can be neglected on the pretext of shorter format of the game and on the back of the expectations that Pakistan would outclass Zimbabwe in ODIs. But Pakistan was themselves outclassed in the first ODI. Somehow, Pakistan won the one-day series and then it was hoped that Zimbabwe would be a piece of cake for Pakistan in the Tests. But on the first day of the match, Pakistan found that the cake was quite difficult to swallow. Pakistani batsmen faced an average bowling attack on a sunny day and on a flat track as if they were facing English pacers on a cloudy day at Lord's on a seaming wicket. I fail to understand that why a good performer of one format fails in the second one. Ahmed Shehzad plays amazingly in T20s but as soon as ODI starts his abilities seem to fade away, and he starts playing selfish and negative cricket to secure his place in the team. Mohammad Hafeez gets man-of-the-series-award in ODIs but as soon as the "professor" wears white kit, he lost his footwork. It looks like centuries against Ireland and Zimbabwe in ODIs have not helped Hafeez to improve his Test batting as if he seems not to have learnt anything from his failure against South Africa early this year. After scoring his career-best 196 against Sri Lanka last year, Hafeez has only scored one century in the next 10 innings. He scored 143 runs in these 10 innings at 14.30. In 2013, Hafeez has only scored 48 runs in 7 innings with an average of 6.85. Even after such poor performance, no one dares to drop the professor from Test side. Khurram Manzoor, who scored 77 runs against Australia in 2010, has been given another chance after 3 years. However, his batting shows that he is not in the mood for availing the chance. The most senior and accomplished batsman in the side Younis Khan also failed against Zimbabwe and only scored 3 runs. If he continues with the performance, it will be difficult for him to remain in Test side in the near future. A score of 27-3 was evident of Pakistan batting line-up failure. But then Azhar Ali, who has made his International comeback after six months, helped the man of crisis Misbah and anchored a partnership of 93 runs. But after Misbah’s departure, Asad Shafiq did not last long. Pakistan lost their eight wickets at 182, including Azhar Ali’s wicket. At that stage, Saeed Ajmal and Junaid Khan scored a partnership of 67 to help Pakistan cross 200-run mark. Pakistan are repeating the same performance as they did against the excellent South African pacers. It is evident that because of playing more shorter format games Pakistani players are losing the ability to judge the ball and doing justice to it. As a result, they are facing problems in Test cricket. Pakistani batsmen turned out to be merely quarter-to-6-run players against Zimbabwe on the first. Either Pakistani batsmen are incapable to do more or their temperament does not allow them to play longer game. I am sure at least one batsman will stabilise himself and play a bigger innings in second innings. Moreover, I am sure that Pakistan will win this series very easily and the entire shortcomings will be covered with the same ease. But when will these quarter-to-6-run batsmen start performing consistently?